All-Way Wire Rope and Splicing, Inc. has been providing high-quality rigging equipment and services to the St. Louis area for decades. In this time, we have established ourselves as the rigging experts with excellent customer support. We are also known for offering a wide-range of rigging equipment with products like our synthetic web slings in St. Louis. Rigging and material handling sometimes need synthetic web slings over the traditional wire rope depending on your job or project. We are proud to be a supplier of synthetic web slings with a team of experts who can provide you with products that are perfect for your specific application. To learn more about the synthetic web slings that we have available to our customers in St. Louis, please call All-Way wire Rope and Splicing, Inc. today at 800-920-3330. You can also get in contact with one of our friendly associates by simply completing the easy-to-use form located on this page. The synthetic web slings offered by All-Way Wire Rope and Splicing, Inc. in St. Louis are made of soft nylon or polyester. 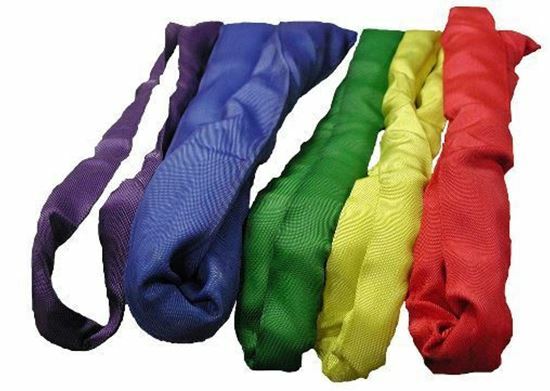 This softer material won’t scratch or damage loads when using these slings. Our synthetic web slings also offer a wide surface area to make sure that materials being moved stay secure. All of the synthetic web slings that we have to offer comply with OSHA regulations and are thoroughly tested to ensure their quality. We offer a variety of synthetic web slings in different sizes and configurations to support a wide number of applications. At All-Way Wire Rope and Splicing, Inc. we offer quality synthetic web slings to provide your project with the best service possible. We pair our exceptional synthetic web slings in St. Louis with affordable pricing and comprehensive customer service. If you would like to find out more about the synthetic web slings offered by All-Way Wire Rope and Splicing, Inc. in St. Louis, please call us now at 800-920-3330. You may also reach out to any of our knowledgeable experts by filling out the online request form located on this page.